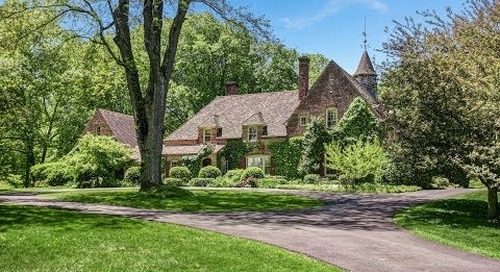 For more information: goo.gl/HwtamU Sophisticated Colonial Rivals Bernardsville Mountain’s Storied Mansions Stone walls, dating from the Gilded Age of the Somerset Hills, front the five acres of meadow and woodland providing the setting for this elegant custom estate. The home offers approximately 12,000 square feet of refined, meticulous living space. Sizeable fieldstones, contrasted with cedar, present in an array of earthtones at the home’s exterior core, then repeat throughout the grounds and structures. Pilasters buttress the soaring gable and Doric columns underpin the portico at the home’s prominent entry. Beautiful spaces, rendered with the finest amenities are at once generously sized and warmly elegant. The senses are drawn to multiple coffered ceilings, stacked crown molding, detailed wainscoting, expansive transom topped windows, clear oak floors. Wide cased entries introduce the formal dining room with uniquely crafted ceiling and living room with marble fireplace and artful Venetian-plaster décor. French doors open to the outstanding mahogany library. The conservatory presents a bowed window wall, cherry wet bar, Italian terracotta-tile floor and French doors opening to the bluestone terrace bordered with fieldstone wall and lush professional landscaping. Virtually breathtaking, the great room boasts two story windows and two story fieldstone fireplace; the cherry built-ins include an entertainment center. In the kitchen ivory-hued cabinetry is accompanied by top-of-the-line appliances and informal dining takes place in the breakfast room, an octagonal swirl of floor-to-ceiling windows. Bedrooms begin on the main level with the first of the home’s en suites. The upper floor’s master suite spans the length of half the residence and has its own foyer entry from the gallery hall. Marble provides the backdrop for the bath’s luxurious appointments. The sitting room includes an entertainment center, the dressing area offers sizeable walk-in closets and a view to the private balcony. Three additional en suites complement this level along with a spacious bonus room. Sophistication bridges a host of entertainment possibilities on the home’s lower level. Among the highlights are a magnificent mahogany theater with gracious bar, a billiards room and a media room. The rustic surfaced wine-tasting room harbors the wine cellar with mahogany racks for 1000 bottles. Or guests can be entertained out-of-doors at the luxury-finish pool with spa and 1500 sq. ft. deck. Echoing the architecture of the main residence, the pool house features a columned porch, full kitchen, bath, laundry, Viking grill center and pergola seating area. 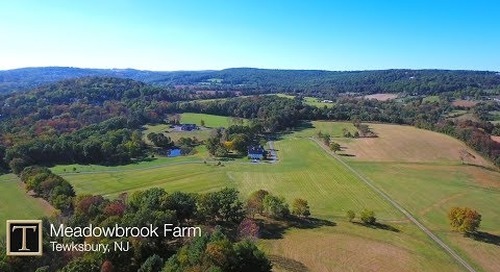 An uncompromising lifestyle awaits on Bernardsville Mountain.